Description: This report displays all profile information for an individual client or for a list of clients. Report on a list of clients OR one client. 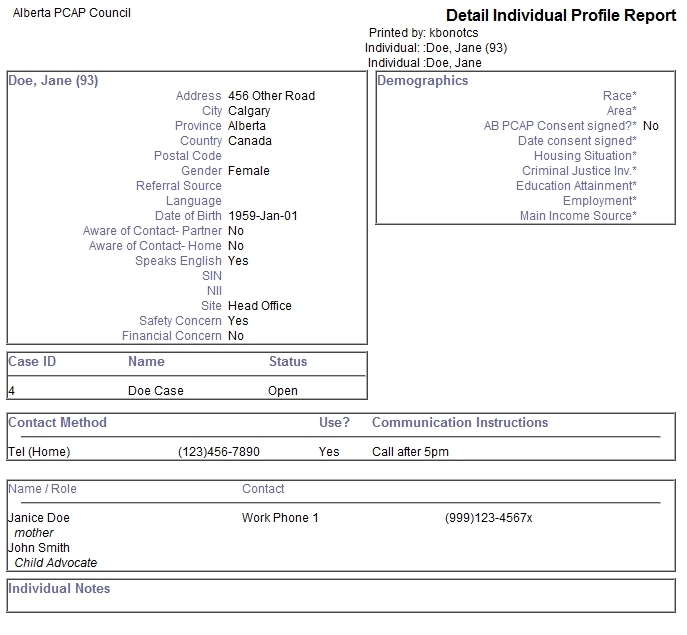 Look for the grey heading “Individual Reports”, and then click the link for “Detail Individual Profile Report”. A box should appear with the title “Parameters”. If you would like a complete list of clients, leave “Individual Added” blank. Otherwise, specify the period: select a pre-set reporting period from the drop-down menu OR select your own start and end date in the two date fields. Remember that the period reflects when a client was added. You may specify a certain Case Worker to see their clients OR leave this field blank to view all the clients at your site. Under “Site”, select your site number. Under “Individual”, type the name of the client. Under “Report Options”, check “Include Documents” if you want all the client’s full biannuals included in the report. Go to the client’s individual profile (by clicking on the client’s first or last name from “My Case Load” or in the search page). Click the “Reports” heading from the right-hand menu bar. Click the link for “Profile Report”. A box should appear with the title “Parameters”. This entry was posted in Reports and tagged individual profile, report on August 30, 2013 by kbonot.